As noted in an earlier post, the Russell 2000 closed back above its 200-DMA yesterday for the 7th cross of that trendline on a closing basis in the last 50 trading days. 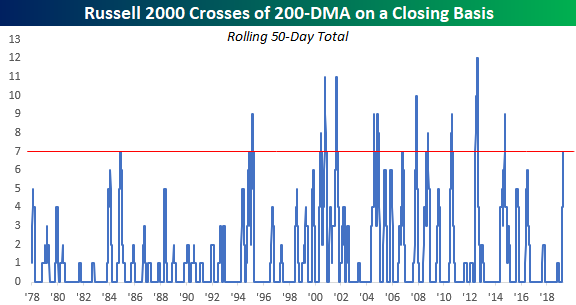 As shown in the chart below, the last time we saw this many crosses of the 200-DMA in a 50-trading day span was back in 2014. Back then, the number of crosses reached as high as nine and the most ever in a 50-trading day span was 12 back in 2012. So what, if anything, does the indecisiveness on the part of the Russell 2000 mean for future returns? Is it a sign that eventually the bulls won’t be able to hang on and lower prices are in store, or does it mean that the bears will finally capitulate, and prices will soar? 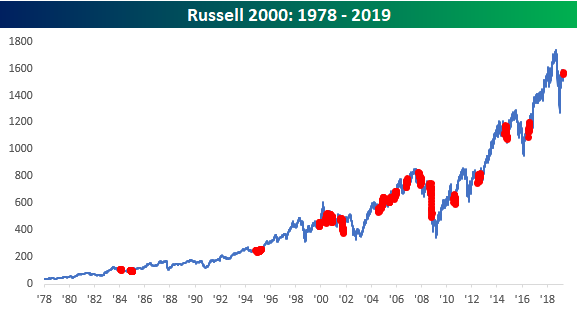 The chart below shows the Russell 2000 going back to 1978, and in it we have included red dots to show every other time where the Russell 2000 saw seven or more crosses of its 200-DMA in a 50-day span. As you can see, there doesn’t seem to be any clear trend in either direction. The mid-2000s are a perfect case in point. From late 2004 right up through late 2008, we saw multiple occurrences both on the way up and on the way down. As far as market indicators go, this one hasn’t been all that helpful. Start a two-week free trial to Bespoke Premium to access Bespoke’s unbeatable research.